Over the past ten or so years, Quentin Tarantino has diligently been working through his favourite genres, like a collector sifting through old records. Tarantino’s desire to find different and more interesting environments to play out his love for exploitation cinema finds a brilliant home in the Spaghetti Western aesthetic of Django: Unchained. While his recent films have felt akin to a geeky kid at school donning the shades and ripped jeans aesthetic of lower-budgeted exploitation films, with Django: Unchained, Tarantino still allows himself to indulge but the film overall feels lighter and more at peace with itself. Set at the midpoint of the 19th century, in the southern states of America, the world of Django: Unchained is one constructed around slavery almost to a point of hyper-reality. It’s prolific use of the ‘N word’ and larger-than-life characters exist in a post-modern vacuum that eliminates the chance for a sensitive dissection of an ugly part of American history. This will be a disappointment - or even cause offence for some - who would not like to see such themes handled with such a light touch. For the less disconcerting however, Django: Unchained is an awfully entertaining film. The plot follows black slave Django (Jamie Foxx) who has been recently sold by his owner, splitting him from his wife, a fellow slave named Broomhilda. 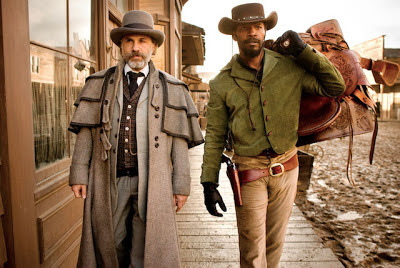 When he is freed by a mysterious bounty hunter Dr. King Schultz (Christoph Waltz) and given the chance to assist him in collecting bounties, he readily accepts - “Kill white people and get paid for it? What's not to like?”. As the pair travel together a bond is quickly formed and a promise made that Schultz will help Django find his lost love and give him his freedom. What follows is a pursuit that puts both men on a collision course with a ruthless plantation owner, Calvin Candie (Leonardo DiCaprio). Tarantino shows a steady hand, not allowing the film to descend into the polemic mess it could have easily become. Comedy is frequently used to throw water on the heated issues and bring the film back into the realms of light-hearted entertainment. 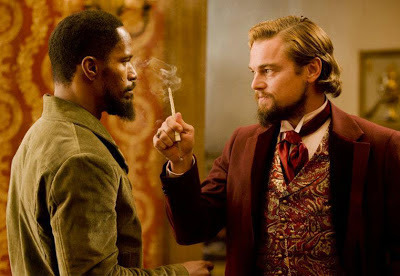 That is not to say Django: Unchained is devoid of social commentary but it knows the boundaries it has set for itself and follows them with conviction. This conviction can falter momentarily when the comic detours from the plot threaten to undermine the narrative, but being so imaginative and well pitched, they serve as a reminder of what a keen comic observer Tarantino is. One scene involves the Ku-Klux Klan complaining how they can’t see through their masks. It is hard to blame Tarantino for halting the narrative when the results are so entertaining. The casting of Jamie Foxx in the lead role is an inspired choice. It’s a familiar role for Foxx who has played similarly downtrodden characters in Collateral and Any Given Sunday. His body language and slow articulation hint at an underlying fire that is wonderfully masked by his shy exterior. The conflict present as Foxx must assimilate himself in white society, while observing the plight of his own race, is subtly portrayed in fleeting moments that linger and resonate on the screen. Likewise Christopher Waltz shines as Dr. Shultz, in a role written for him. 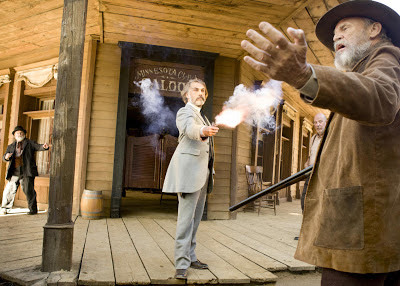 Making the character German allows Waltz to use his native accent with a hint of American twang which instantly sets him apart in the Wild West setting. Being the first character the audience are first formally introduced to, Shultz is the mentor that guides Django and the viewer through the early sections of the film and his eccentric humour and quick wit make him instantly endearing. The relationship between the men is so effective that in many ways it overshadows the romantic plot between Django and Broomhilda. The couple remain apart for a large portion of the film and early scenes try to address this by depicting Django having hallucinations of her which come across more forced and clichéd than anything. The film never creates much of an emotional hook or context to their relationship and therefore makes it harder to invest in Django’s quest for her. When Broomhilda finally features she doesn’t have much to say and the audience is left to wonder what kind of life they will lead if united. Leonardo Dicaprio’s powerhouse performance as the plantation owner Calvin Candie is a mixed blessing. The simmering rage that Dicaprio seems to have ‘on tap’ is palpable in every scene. As Django’s cockiness grows, the locking of horns between the black slave and the white slaver are some the movies most tense moments. Unfortunately Tarantino is slightly overzealous with his new star and while the pace of the film is brisk at first, it’s stopped dead by some interesting but overly prolonged dialogue scenes upon his arrival. These are wonderfully embellished by Samuel L Jackson’s role as Candie’s advisor Stephen, whose pompous pride to be a step above his fellow slaves is wonderfully portrayed by Jackson who steals every scene with brilliant mannerisms and some masterful dialogue. The film concludes at just under the three hour mark and in truth could have been shorter. A more action orientated conclusion is introduced to bring things to a head but in light of the tense dialogue that precedes it, the violent end feels like an overdue and somewhat trivial conclusion. The style of this action is as over-the-top as audiences have become accustomed to with Tarantino’s films. Guns roar like canons and every character that has the misfortune of meeting a bullet bursts and sprays so much blood and gore it’s hard to take at face value. Contrasting the action scenes are more realistically rendered scenes of slaves in peril that make the shootouts seem incredulous by comparison. One scene that intercuts a harp being played and a dog attacking a slave was such a blunt and forceful juxtaposition that it did more with a few seconds then a 10 minute dialogue scene ever could. Despite a temporary halt in momentum and an ending that takes its time to provide a resolution, Django: Unchained is engaging throughout. It is the sense of fun and playfulness - that has sometimes been bogged down by heavy handed ideas in Tarantino’s recent efforts - that shines through here. This is further stimulated by a cast who elevate even simple exchanges into scenes that fluctuate from tension to comedy and make the whole experience simply a joy to watch. 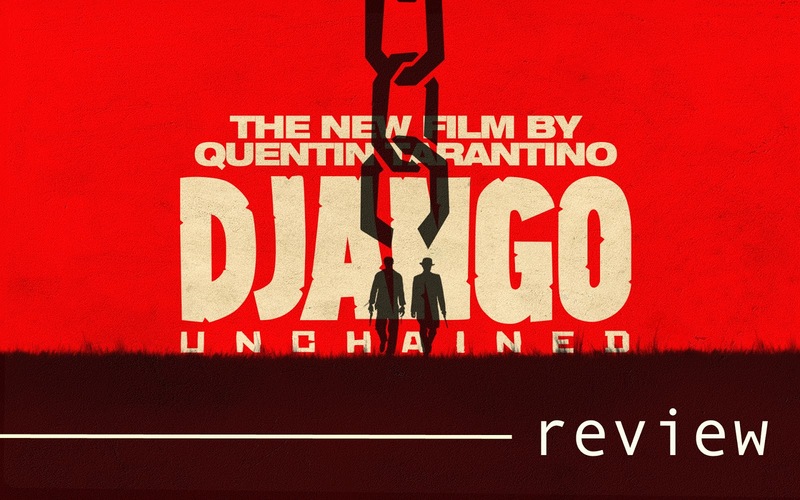 Despite some deficiencies in the narrative, Django: Unchained is an entertaining triumph. It is sure to ruffle some feathers with the whimsical treatment of its dark subject matter but it’s good to see Tarantino back, pushing buttons the only way he knows how. Press access for this screening of Django Unchained was provided courtesy of WayToBlue. (A)musings Media gratefully acknowledges their generous invitation.